Menya Musashi: Famous Tokyo Ramen Chain in KL for Limited Time…Go Grab A Bowl Now! If you ask any locals in Tokyo to name the place they head to for their favourite bowl of ramen in the bustling metropolis, chances are the name Menya Musashi would crop up as one of the top suggestions. And that would definitely explain the famous long queues in front of their flagship Shinjuku store during lunch hour on weekdays since it first opened in 1996. Since then, they have opened 11 outlets all around Tokyo. Its name refers to the famous Edo-era swordsman Miyamoto Musashi, who has written a textbook on the martial arts practice of kenjitsu entitled Gorin No Syo(The Book of 5 Rings). Taking inspiration from the warrior’s book, Menya Musashi operates on 5 Ramen Principles: CHI (basic), SUI (idea), HI (reason), KAZE (analysis) and KU (truthfulness), as they aim to create the perfect bowl of ramen. Over the years, I’ve heard plenty of good things about them and could only drool over pictures of their ramen, dreaming of the day when I can finally get a taste of it. You can imagine how bummed I was when I didn’t get my chance to visit during a short business trip to Tokyo two years back. But as fate would have it, I chanced upon a cosy promotional kiosk in Isetan’s newly-refurbished FoodMarket in KLCC yesterday. Walking around, I saw a couple of customers with their faces quietly buried in big bowls of noodles. Curiosity got the better of me; or rather temptation did as I lusted over the wonderful aroma that was wafting through the air. I turned the corner and saw a sign bearing the name of the famous Tokyo ramen chain. Instantly, I forgot all about the sandwich I had 10 minutes before that and placed a quick order for their Chicken & Vegetable Ramen. It turns out they only serve a limited 100 bowls a day or until the broth sells out. I was lucky enough to get myself the final one for the day. And it was only a little after 2pm. The kiosk currently operates under Isetan’s Japan Gourmet Fair umbrella and is only here for a limited time, from 17 to 26 February. No doubt that the chain is better known for their non-halal versions, but the Chicken & Vegetable ramen in sh?yu (soy sauce) style broth did not disappoint even a single bit. The broth, which is somewhat similar to a miso-based stock, is blended with a heavy layer of chicken oil which resulted in a wonderfully rich, slightly sweet and very hearty soup — all at once repelling the notion that chicken-based broths are inferior to their porky cousins. Now apart from the soup, the true test of a good bowl of ramen also lies in its namesake — the noodles itself. Menya Musashi is famous for their perfectly thick egg ramen, which were chewy and springy (al dente or “Q”) and carried the flavours of the soup base perfectly. Each bowl was adorned with copious amount of menma (marinated bamboo shoots) and spring onions. Suffice to say, it was the best RM25 I’ve ever parted ways with and along with that my diet plans for the day too. So much for having just a light lunch. And by the way, do not forget to slurp up every last drop of its prized broth to see the surprise at the bottom of the bowl. Menya Musashi’s pop-up stall is available from February 17 – 26, 2012 and operates from 11am – 7pm and offers a limited pork-free menu. This article was first published on The Malaysian Insider‘s Food column on 21 February 2012. 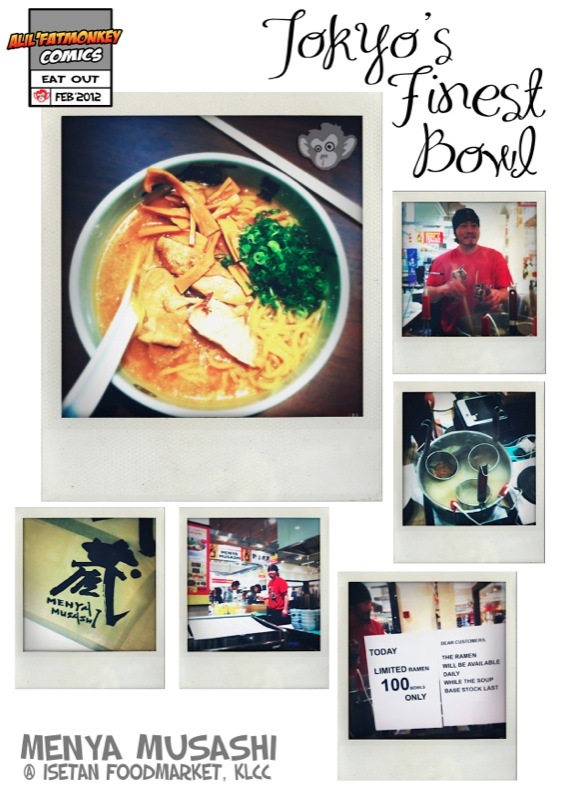 Food Blog by: Menya Musashi: Famous Tokyo Ramen Chain in KL for Limited Time…Go Grab A Bowl Now!